The vast majority of parents of online teens have had serious conversations with their kids about online life, the problems associated with it, and ways to navigate those spaces. A majority of parents monitor their kids’ online behavior. Relatively high numbers of parents have become friends with their offspring on social network sites. 91% of parents of children ages 12-17 own cell phones, and 86% of those cell owners send and receive text messages. The most recent Pew Internet Project survey of the general population in August showed that 84% of all adults have cell phones and 76% of them exchange text messages. 87% of parents of teens are internet users (vs. 78% of those in the overall adult population) and 82% have broadband connections at home (vs. 62% of those in the overall population). 86% of parents of teens own laptops or desktops, compared with 76% of those in the overall adult population. Online parents are just as likely as the general population of adult internet users to use social network sites; 67% of online parents of teens use social network sites like Facebook or LinkedIn, compared with 64% of all adult internet users. Even though there is widespread adoption and use of technology among parents, there is some variance by class, age, and race to some aspects of technology use. 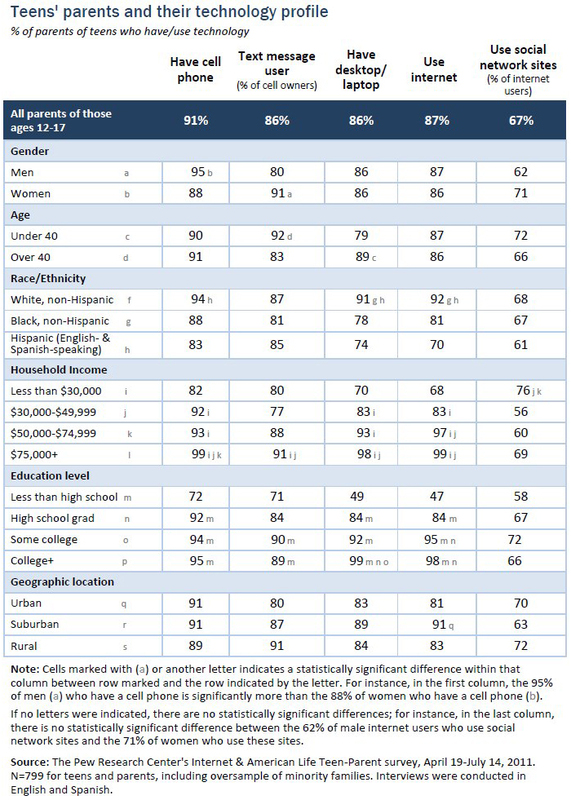 Generally, families that are relatively well off and where the parent has a high level of education are more likely than others to own a cell phone, own a computer, and use the internet. In addition, white parents of teenagers are more likely than minority parents to own a cell phone or a computer and to use the internet. At the same time, once a parent owns a cell or uses the internet, she is just as likely as other parents to be a text message user and a participant on a social network site.